The GMAT Analytical Writing Assessment (AWA) is devised to measure the ability of the candidate to think critically and to communicate thoughts and ideas. In the GMAT Analytical Writing Assessment (AWA), the candidates are required to analyze the reasoning behind a given argument and write a critique of that argument. 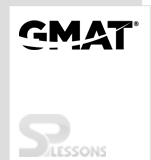 The GMAT Analytical Writing Assessment(AWA) section includes 1 topic (Analysis of Argument) with an allotted time of 30 minutes. The scores for this segment are on a six point scale. Your essay is given two independent ratings and then an average is considered. One of these scores is finished by an automated essay-scoring engine. If the distinction between both the ratings is more than one point, a third rating would be provided by an expert reader which would then be the final score. In this section, you will be asked to write a critique of the argument presented. You are NOT being asked to present your own views on the subject. This argument states that it makes financial sense for employers to make the workplace safer because by making the workplace safer then lower wages could be paid to employees. This conclusion is based on the premise that as the list of physical injury increases, the wages paid to employees should also increase. However, there are several assumptions that may not necessarily apply to this argument. For example, the costs associated with making the workplace safe must outweigh the increased payroll expenses due to hazardous conditions. Also, one must look at the plausibility of improving the work environment. And finally, because most companies agree that as the risk of injury increases so will wages doesn’t necessarily mean that all companies which have hazardous work environments agree. This argument also relies on the idea that companies solely use financial sense in analyzing improving the work environment. This is not the case. Companies look at other considerations such as the negative social ramifications of high on-job injuries. For example, Toyota spends large amounts of money improving its environment because while its goal is to be profitable, it also prides itself on high employee morale and an almost perfectly safe work environment. However, Toyota finds that it can do both, as by improving employee health and employee relations they are guaranteed a more motivated staff, and hence a more efficient staff; this guarantees more money for the business as well as more safety for the employees. Finally one must understand that not all work environments can be made safer. For example, in the case of coal mining, a company only has limited ways of making the work environment safe. While companies may be able to ensure some safety precautions, they may not be able to provide all the safety measures necessary. In other words, a mining company has limited ability to control the air quality within a coal mine and therefore it cannot control the risk of employees getting black lungam. In other words, regardless of the intent of the company, some jobs are simply dangerous in nature. In conclusion, while at first it may seem to make financial sense to improve the safety of the work environment sometimes it truly does not make financial sense. Furthermore, financial sense may not be the only issue a company faces. Other types of analyses must be made such as the social ramifications of an unsafe work environment and the overall ability of a company to improve that environment (i.e., coal mine). Before any decision is made, all these things must be considered, not simply the reduction of payroll expenses. In the argument above, the author concludes that the city council is not doing its job well and needs to focus on expanding significantly the police force in order to combat recent growth in the level of crime. The premise of the argument is that crime is expanding while the city council focuses on ostensibly unrelated matters such as education reform. However, the argument is flawed because it falsely assumes that the city council’s efforts to improve quality of life are entirely unrelated to levels of violence and it assumes that the crime problem can be solved by merely increasing the police force. First, the argument wrongly assumes that issues of educational opportunity, community vitality, and job availability have no bearing on crime. However, the author fails to support this assumption. It is entirely possible that the crime level spiked due to a recent and sizeable layoff at a major nearby factory that pushed countless citizens out of work and onto the streets. With individuals struggling to survive, it should come as no surprise that people are turning to crime. Second, the reasoning in the editorial is flawed because it erroneously assumes that increasing the police force will directly address the root of the crime problem and reduce the level of crime. Yet, a landmark study published in early 2008 showed that increasing the size of a police force beyond a certain point provides extremely small marginal returns in the reduction of crime. Given the fact that the local police force is already above this threshold, the editorial’s author wrongly assumed that a doubling of the police force will materially decrease the crime rate. Moreover, the argument could be improved by appealing to the city’s history with fighting crime and managing the size of its police force. In particular, approximately 25 years ago, the city council faced a situation very similar to the one it faces today: a rising crime rate and growing spending on community development. The city council decided to increase the size of its afterschool programs’ budget by about 75% and this reduced crime dramatically. Faced with the same situation today, the city council should follow the path it took 25 years ago. In conclusion, the argument in the newspaper editorial is flawed because it assumes that educational opportunity, job availability, and community vitality are not related to the level of crime a community experiences. Moreover, the argument wrongly concludes that an increase in the police force will address the root issue behind the crime, which the argument assumes is an inadequate number of police officers. A recent study shows that people living on the continent of North America suffer 9 times more chronic fatigue and 31 times more chronic depression than do people living on the continent of Asia. Interestingly, Asians, on average, eat 20 grams of soy per day, whereas North Americans eat virtually none. It turns out that soy contains phytochemicals called Is flavones, which have been found to possess disease-preventing properties. Thus, North Americans should consider eating soy on a regular basis as a way of preventing fatigue and depression. The above argument tries to establish a direct link between soy consumption and chronic fatigue and depression. The underlying basis of the argument is that soy protein contains phytochemicals called Isoflavones, which are found to possess disease-preventing properties. However, disease is a much larger term, which does not cover only fatigue and depression, but also a host of other medical conditions. Moreover, it is seen that chronic fatigue and depression are also the results of high profile life, which leads to insomnia and stress. Chronic fatigue and depression can be the symptoms of some other diseases also. The weather conditions, economic stature and work environment of Asia and North America are very different from each other. People in these continents have different lifestyles. Their attitude towards life is also very different. These health related problems could not be certainly related with the intake of a certain kind of food that is soy foods. Therefore, it is very important to establish a direct relation between soy foods and chronic fatigue and depression before arriving at any conclusion. The second point is that fatigue and depression are totally different from each other as scientifically they are treated differently. You cannot categorize them in the same group. You need to consult a psychologist to treat depression and a doctor for fatigue related problems. Hence, there cannot be the same solution for two different problems. Above all, according to the author, chronic fatigue is 9 times and depression is 31 times more in North Americans as compared to their Asian counterparts. There is a huge difference between 9 and 31. Therefore, you cannot relate or treat them together. There are definitely going to be different reasons for the two diseases. According to the author, soy foods contain a chemical called Isoflavones, which have disease preventing properties. However, there is no study, which reveals that it is relevant for all types of diseases. Hence, a research has to be done to establish that the drugs used to treat these two diseases contain Isoflavones. However, it is a known fact that soy foods are good for human health as soy foods contain many nutrients required for the human body. Again, there is no solid evidence that eating soy foods on a regular basis is a solution for chronic fatigue and depression. The author has not even mentioned about any side effects of Isoflavones. Hence, the suggestion to take soy foods daily, without any detailed study about soy food, does not hold any ground. Hence, it can be said that one should take soy foods for overall health. It is a possibility that soy foods can be helpful in treating or preventing some diseases, which further have chronic fatigue or depression as its symptoms. That way one can link these two diseases with Isoflavones. However, there is no direct relation between soy proteins and chronic fatigue and depression; it is not justified in the given argument. The author should have provided a few proofs and data to establish this relationship. According to the conclusion of this editorial, the new and larger building of town hall in place of the old one will help in saving money and energy. However, many points given in support of the views of the writer are not very convincing. Although, there is no doubt that the new proposed building will have many advantages over the old town hall, but the author has ignored to mention many important points. He has completely failed to provide evidence for his reasons to build the new building. The points given by the author have no relevant relation among themselves. For example, the cost effectiveness and the fact that the old building is not able to accommodate its employees are not related anywhere. He has tried to explain the need of the new town hall but has neglected to suggest the alternative measures that can be taken to solve the problems faced by the old town hall. The author has talked about the larger and the energy efficient new building. According to him, it would cost less per cubic foot to heat and cool the new building as compared to the old town hall building. However, he has easily forgotten to mention the overall cost of heating and cooling the much larger new building. This cost might be much higher than the current expenses. In addition, there will be the costs of constructing the new building and installing new systems. The author has not even mentioned the option of installing new heating and cooling systems in the old building. The upgradation of the old system might be more cost effective. Besides, the new building might also need some maintenance fee to maintain the new facilities added to the building. The second point on which the author is insisting is that the current building cannot comfortably accommodate all the people who work in it. This point is anyways not related to the money saving measures the author is talking about. Here again, the author has ignored other more effective solutions for this problem. For example, adding another structure for the employees. Another point is about the renting out of the parts of the new property to generate some income. However, the views of the author are contradictory as on one hand, he is explaining the need of a larger building and on the other hand, he is talking about the renting out some part of property. Hence, if the new and larger building is the need of the hour then there is no scope of additional income. The author has failed to give enough and strong evidence for the requirement of the new building. He has also forgotten to consider the heritage value of the Rockingham’s century old town hall. Hence, the author has to collect more information about the old building. The author must search for some solid evidence. He should do a complete and detailed study of comparing the cost effectiveness of both the options including the initial cost of setting up the new building and replacing the old heating system in the old building. The author has to work towards making his editorial logically more correct. Claitown University needs both affordable housing for its students and a way to fund the building of such housing. The best solution to this problem is to commission a famous architect known for experimental and futuristic buildings. It is common knowledge that tourists are willing to pay money to tour some of the architect’s buildings, so it can be expected that tourists will want to visit this new building. The income from the fees charged to tourists will soon cover the building costs. Furthermore, such a building will attract new students as well as donations from alumni. And even though such a building will be much larger than our current need for student housing, part of the building can be used as office space. This argument is about hiring a famous architect to build a cost effective building to house the students of Claitown University. However, it seems from the author’s statement that the University does not have enough funds to construct this kind of building. The author’s line of thought is not very convincing. He has not been able to give logics for his reasons. He should have gone in details of the cost of the new building and other costs and the source of this money. This argument has many loopholes as the author is talking on the basis of his assumptions. First of all, he is talking about commissioning a famous architect, who might charge a heavy amount for his work. It will add a heavy burden on the University’s budget. The author has simply skipped this line of reasoning. He has not included this expenditure in the cost. The author is assuming that all the expenditure related to the building will be taken care of by the funds coming from the students’ fee, donations coming from the alumni and the amount paid by tourists to visit the new building. However, all these are just assumptions. The author has not considered the possibility that the tourists might not be interested in visiting a building that is meant for students’ housing. Once the students start using the building, tourists will not be attracted towards the building or they might be happy by watching it from outside only. That way there will not be any income from the tourists. Hence, the argument’s claim fails to prove that a famous architect’s work will generate income for the balancing of costs. The author has not even explained the source of money to construct the building. The building will receive the funds from students in the form of fee and other funds only when the building will be in use. Hence, this argument holds base only if the architect agrees to take his payment later on and the supplier also supplies the construction material without taking any advance. Further, the author has talked about attracting new students and the old students who can make donations. However, he has not provided any evidence to support his views neither he has given any example of some other university. It might be possible that the old alumni are more attached to the existing building. Therefore, one cannot accept this conclusion without any proof. In short, we can say that the author could not support his argument. He has not supplied any evidence to prove his point. He should have studied similar cases of other college buildings that were designed by famous architects and tourists are interested in visiting and paying to watch them. The author should also have emphasized on the detailed explanation of the financial aspects of the building project. A survey of old students and alumni also would have been a good idea as then we will know how interested students are to make donations. As a result of numerous consumer complaints of dizziness and nausea, Promofoods requested that eight million cans of tuna be returned for testing last year. Promofoods concluded that the cans did not, after all, contain chemicals that posed a health risk. This conclusion is based on the fact that the chemists from Promofoods tested samples of the recalled cans and found that, of the eight chemicals most commonly blamed for causing symptoms of dizziness and nausea, five were not found in any of the tested cans. The chemists did find that the three remaining suspected chemicals are naturally found in all other kinds of canned foods. This argument is based on the complaints of nausea and dizziness from the consumers who have used canned tuna. Although Promofoods had recalled eight million cans of tuna and also some samples of tuna to lab for testing, it concluded that the cans did not contain any chemical, which can cause any health hazard. The results of the tests done by chemists from Promofoods do not hold any ground, as these results are not supported by any strong evidence. As per the chemists from Promofoods, there are eight chemicals responsible for dizziness and nausea and five of them were not present in the tested cans of tuna. However, they have not considered the possibility that certain chemicals in contact with other chemicals can also cause dizziness and nausea. The results of this testing can also be biased as the testing has been done only on a few samples. Hence, it cannot be said that five chemicals not present in the tested samples were not present in the cans consumed by the affected buyers. Promofoods should have collected the cans from where tuna was consumed and that caused health risk for many people. It might be possible that those cans contained these chemicals. When it comes to testing, you cannot generalize the results. According to Promofoods, five suspected chemicals were not present in the tested samples and the other three are present in the other canned foods and do not cause any bad effect. However, this is again without any strong evidence. It is just an assumption that the chemicals, which do not cause any bad effect in one canned food, will not cause any ill effect in canned tuna. It might be possible that one of these chemicals causes health risk when exposed to some specific chemical present in tuna. Hence, it is not right to say in general that tuna cans were not responsible for the symptoms of dizziness and nausea. It can be said the whole conclusion of Promofoods is based on weak evidence. The results of the tests done by the chemists are not very convincing. Promofoods should have done tests on a large number of canned tuna. It should have gathered more results to make its study more convincing. However, it cannot be said that the study done by Promofoods is baseless. It is entirely possible that there are some other chemicals, which are responsible for the symptoms of nausea and dizziness and it is not found yet. Promofoods should also take this possibility into account. In the end, it can be said that the entire study of this argument is based on assumption that the eight chemicals responsible for nausea and dizziness were not present in the tuna cans. This is an important study and Promofoods should work on providing stronger evidence. They have to prove that there was no biased sampling and the testing was correct. The chemists have to prove that the three chemicals, which are normally found in other canned foods, do not cause any harmful effect in tuna. People should not be misled by the advertising competition between Coldex and Cold-Away, both popular over-the-counter cold medications that anyone can purchase without a doctor’s prescription. Each brand is accusing the other of causing some well-known, unwanted side effect: Coldex is known to contribute to existing high blood pressure and Cold-Away is known to cause drowsiness. But the choice should be clear for most health-conscious people: Cold-Away has been on the market for much longer and is used by more hospitals than is Coldex. Clearly, Cold-Away is more effective. This argument is about the two competing products, Coldex and Cold-Away. Both the medicines are cold medicines available over-the-counter. Both the brands compete with each other and accuse each other for some side effect. According to the author, Coldex is responsible for causing high blood pressure and Cold-Away causes drowsiness. Here, the author seems a little biased as without providing any evidence, he is suggesting that as Cold-Away is in the market for a longer period, it is more effective and it should be the clear choice of customers. The logic provided by the author is very dubious and unconvincing. The author is simply trying to boost the consumer’s ego by saying that the choice should be clear for most health-conscious people. Though it is a good advertising tactic used by the company, it cannot be considered as enough proof of Cold-Away being more effective. The author is giving one more logic that Cold-Away is in the market for a longer period. However, this fact also does not add any effectiveness to the argument. The new medicine might have new effective ingredients. It is not necessary that well-established products are better than newer ones. Moreover, latest medicines often make use of new pharmaceutical developments than the existing products. Instead of this, the author should have concentrated on the plus and minus points of the two medicines. According to the author, Cold-Away is used by more hospitals than Coldex that is the reason enough to consider Cold-Away more effective. This is again an advertising gimmick and not a proof that it is more effective. There might be some other reasons for hospitals using Cold-Away. It is just an assumption of the author that the hospitals are recommending Cold-Away because it is better than Coldex. It might be that doctors are using this medicine because of its drowsiness inducing effect to calm their patients. For that matter, perhaps hospitals use Cold-Away primarily for this effect rather than as a cold medication. One more problem with this argument is the side effect of Coldex. If Coldex is the cause of high blood pressure then, obviously no doctor will recommend it. However, people who do not suffer with the problem of high blood pressure can still use it. Thus, Codex’s side effect is irrelevant in choosing between the two products. Moreover, if a person without high blood pressure wishes to avoid drowsiness during the treatment of cold, Coldex would seem to be the preferable medication than Cold-Away. The author has not offered convincing evidence to support his views. He should have strengthened his argument by providing the evidence that the doctors and hospitals use Cold-Away because of its effectiveness in treating cold. A data of clinical research or a reliable data of general survey would have supported the argument in a better way. It should not be based on assumptions. In the present form, it just looks like an advertisement tactic to increase the sale of one product. It is just trying to persuade people to buy Cold-Away. A folk remedy for insomnia, the scent in lavender flowers, has now been proved effective. In a recent study, 30 volunteers with chronic insomnia slept each night for three weeks on lavender-scented pillows in a controlled room where their sleep was monitored. During the first week, volunteers continued to take their usual sleeping medication. They slept soundly but wakened feeling tired. During the second week, the volunteers discontinued their medication. As a result, they slept less soundly than the previous week and felt even more tired. During the third week, the volunteers slept longer and more soundly than in the previous two weeks. This shows that over a short period of time lavender cures insomnia. Everybody wants to have sound sleep, whether it is an over-worked person or a person affected from a disease called chronic insomnia. This argument is about the cure for the same sleeping disorder called chronic insomnia. The persons suffering from this disease find difficulty in sleeping. The basis of this argument is a study of 30 volunteers who were suffering from chronic insomnia. The results of this study show that insomnia can be cured over a period by using lavender. However, the author has not offered enough evidence to support this conclusion. He has not even considered many possibilities. In the beginning, the author has mentioned that the usual medication of 30 volunteers allows them to sleep soundly but they feel tired when they get up. However, the author has not considered many other insomniacs who are taking medications and not feeling tired on waking up. Therefore, there is also an option of these volunteers going to their doctor and telling him about their problem of feeling tired. Their problem might be corrected by a change in their medicines. The author has also mentioned about discontinuing the medication of the volunteers. According to him, even in the absence of any medicine, patients have responded to lavender therapy. However, he has not taken the factor of controlled room environment into consideration. The controlled room environment and the normal environment of the volunteers might yield different results when their medication is discontinued. Moreover, this study is done in a controlled room. This factor cannot be ignored. The author has not checked the results of using lavender scent in their normal sleeping place. You cannot ignore the role of controlled environment in the sound sleep of the volunteers. The author has ignored the effect of peace provided by the controlled room along with the lavender scent. There is also possibility of there being a highway or a railway line close to the residences of the volunteers, which might be a big factor in their problem of chronic insomnia. Hence, the same study should have been done in their normal circumstances. It would have provided stronger evidence regarding the study of lavender curing insomnia. One more thing that goes against this argument is that now a day’s medical science has developed largely. If, according to this study, lavender was so successful in curing insomnia, then doctors would have used lavender in their treatment of insomniac patients. However, until now, no doctor has used it in his or her medication nor does any medicine related to insomnia contain lavender. The most important factor is that this study is done only on a small group that contains only 30 persons while there are millions of people who are suffering from the same problem. It is not feasible to think that the same results will work for all the patients suffering from chronic fatigue. Hence, the study should have been based on a larger group. Hence, we can say that although the author’s argument might be true, he should have collected more evidence in his favor. A study of just 30 volunteers cannot be considered enough proof for use of lavender as a medicine. I agree with the speaker that it is sometimes necessary, and even desirable, for political leaders to withhold information from the public. A contrary view would reveal a naivetd about the inherent nature of public politics, and about the sorts of compromises on the part of well-intentioned political leaders necessary in order to further the public’s ultimate interests. Nevertheless, we must not allow our political leaders undue freedom to with-hold information, otherwise, we risk sanctioning demagoguery and undermining the philosophical underpinnings of any democratic society. One reason for my fundamental agreement with the speaker is that in order to gain the opportunity for effective public leadership, a would-be leader must first gain and maintain political power. In the game of politics, complete forthrightness is a sign of vulnerability and naivete, neither of which earn a politician respect among his or her opponents, and which those opponents will use to every advantage to defeat the politician. In my observation some measure of pandering to the electorate is necessary to gain and maintain political leadership. For example, were all politicians to fully disclose every personal foibles, character flaw, and detail concerning personal life, few honest politicians would ever by elected. While this view might seem cynical, personal scandals have in fact proven the undoing of many a political career; thus I think this view is realistic. Another reason why I essentially agree with the speaker is that fully disclosing to the public certain types of information would threaten public safety and perhaps even national security. For example, if the President were to disclose the government’s strategies for thwarting specific plans of an international terrorist or a drug trafficker, those strategies would surely fail, and the public’s health and safety would be compromised as a result. Withholding information might also be necessary to avoid public panic. While such cases are rare, they do occur occasionally. For example, during the first few hours of the new millennium the U.S. Pentagon’s missile defense system experienced a Y2K- related malfunction. This fact was withheld from the public until later in the day, once the problem had been solved; and legitimately so, since immediate disclosure would have served no useful purpose and might even have resulted in mass hysteria. Having recognized that withholding information from the public is often necessary to serve the interests of that public, legitimate political leadership nevertheless requires forthrightness with the citizenry as to the leader’s motives and agenda. History informs us that would-be leaders who lack such forthrightness are the same ones who seize and maintain power either by brute force or by demagoguery–that is, by deceiving and manipulating the citizenry. Paragons such as Genghis Khan and Hitler, respectively, come immediately to mind. Any democratic society should of course abhor demagoguery, which operates against the democratic principle of government by the people. Consider also less egregious examples, such as President Nixon’s withholding of information about his active role in the Watergate cover-up. His behavior demonstrated a concern for self- interest above the broader interests of the democratic system that granted his political authority in the first place. In sum, the game of politics calls for a certain amount of dis ingenuousness and lack of forthrightness that we might otherwise characterize as dishonesty. And such behavior is a necessary means to the final objective of effective political leadership. Nevertheless, in any democracy a leader who relies chiefly on deception and secrecy to preserve that leadership, to advance a private agenda, or to conceal selfish motives, betrays the democracy-and ends up forfeiting the political game. I strongly agree with the assertion that significant advances in knowledge require expertise from various fields. The world around us presents a seamless web of physical and anthropogenic forces, which interact in ways that can be understood only in the context of a variety of disciplines. Two examples that aptly illustrate this point involve the fields of cultural anthropology and astronomy. Consider how a cultural anthropologist’s knowledge about an ancient civilization is enhanced not only by the expertise of the archeologist–who unearths the evidence—but ultimately by the expertise of biochemists, geologists, linguists, and even astronomers. By analyzing the hair, nails, blood and bones of mummified bodies, biochemists and forensic scientists can determine the life expectancy, general well-being, and common causes of death of the population. These experts can also ensure the proper preservation of evidence found at the archeological site. A geologist can help identify the source and age of the materials used for tools, weapons, and structures–thereby enabling the anthropologist to extrapolate about the civilization’s economy, trades and work habits, life styles, extent of travel and mobility, andso forth. Linguists are needed to interpret hieroglyphics and extrapolate from found fragments of writings. And an astronomer can help explain the layout of an ancient city as well as the design, structure and position of monuments, tombs, and temples–since ancients often looked to the stars for guidance in building cities and structures. An even more striking example of how expertise in diverse fields is needed to advance knowledge involves the area of astronomy and space exploration. Significant advancements in our knowledge of the solar system and the universe require increasingly keen tools for observation and measurement. Telescope technology and the measurement of celestial distances, masses, volumes, and so forth, are the domain of astrophysicists. These advances also require increasingly sophisticated means of exploration. Manned and unmanned exploratory probes are designed by mechanical, electrical, and computer engineers. And to build and enable these technologies requires the acumen and savvy of business leaders, managers, and politicians. Even diplomats might play a role–insofar as major space projects require intemafional cooperative efforts among the world’s scientists and governments. And ultimately it is our philosophers whose expertise helps provide meaning to what we learn about our universe. In sum, no area ofinteUectual inquiry operates in a vacuum. Because the sciences are inextricably related, to advance our knowledge in any one area we must understand the interplay among them all. Moreover, it is our non-scienfists who make possible the science, and who bring meaning to what we learn from it.